Following a custom maintained throughout her widowhood, Queen Victoria spent the Christmas of 1900 at Osborne House. Rheumatism in her legs had rendered her lame, and her eyesight was clouded by cataracts. During early January, she is reported to have felt ‘weak and unwell’. Queen Victoria died at Osborne House age 81, on Tuesday 22nd January 1901, at half past six in the evening. Her son and successor Kind Edward VII, and her eldest grandson, Emperor Wilhelm II of Germany, were at her deathbed. Her favourite Pomeranian dog Turi, was laid upon her deathbed as a last request. 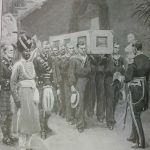 In 1897 Queen Victoria had written instructions outlining her funeral arrangements. Accordingly, on 25th January, Edward VII, the Kaiser and Prince Arthur, Duke of Connaught assisting in lifting her body into the coffin. The Queen was dressed in a white dress and wore her wedding veil. 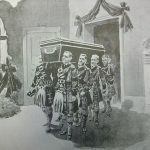 At her request, the Queen’s doctor and dressers placed in the coffin an array of mementos commemorating her extended family, friends and servants. 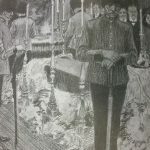 Amongst the items placed with Queen Victoria were; one of Prince Albert’s dressing gowns, a plaster cast of his hand, whilst a lock of John Brown’s hair, along with a picture of him, was placed in her left hand concealed from the view of the family by a carefully positioned bunch of flowers. Items of jewellery placed on Queen Victoria included the wedding ring of John Brown’s mother, given to her by Brown in 1883. 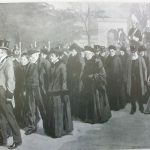 Queen Victoria’s funeral was held on Saturday 2nd February at St George’s Chapel, Windsor Castle. 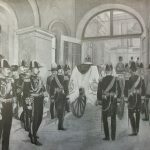 After two days of lying-in-state, she was interred beside her late husband Prince Albert in Frogmore Royal Mausoleum at Windsor Great Park; a monument Victoria had built for their final resting place. 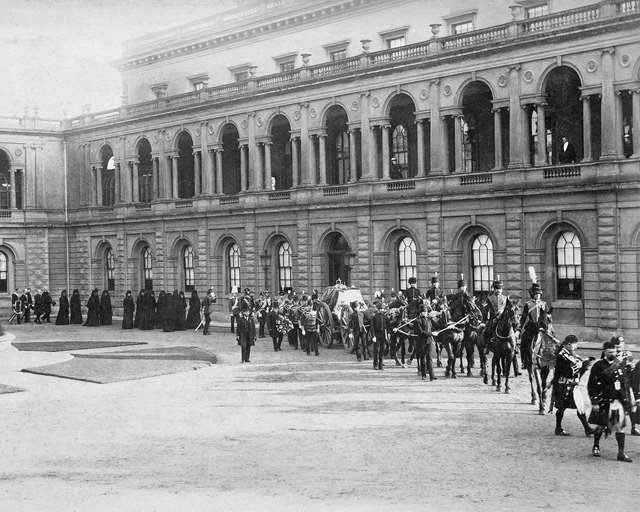 Prince Albert had preceded Queen Victoria in death by almost 40 years. With a reign lasting 63 years, 7 months and 2 days, Queen Victoria was the longest reigning British monarch and the longest reigning queen regnant in world history until her great-great-granddaughter Elizabeth II surpassed her on 9th September 2015. Queen Victoria was the last monarch of Britain from the House of Hanover as her son and successor Edward VII belonged to Prince Albert’s House of Saxe-Coburg and Gotha.